Michael Scott and David Brent will finally meet face-to-face on January 27. Steve Carell is set to leave The Office in a few short months, but not before he gets some facetime with his British predecessor. 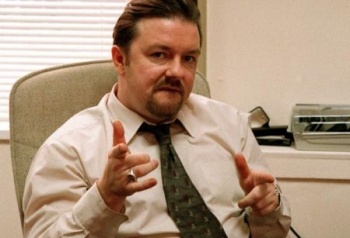 Ricky Gervais will appear on the American version of The Office, reprising his role as David Brent from the original British Office. Showrunner Paul Lieberstein told New York Magazine's Vulture that the interaction is pretty short: "It's a little more than if you blink, you'll miss it, but if you don't set your TiVo right, you'll miss it." He also acknowledged that it was a difficult meeting to reconcile within the worlds of the respective shows, what with both characters being followed by documentary filmmakers. Ultimately, Lieberstein tells Vulture, the meeting will take place "outside of the office, and it's just the two of them interacting. It's just a little nod to Steve and his final year." The scene was actually filmed back in September, and, according to Vulture, Lieberstein says "we didn't even tell NBC at first. So [Ricky] worked for free. But don't print that -- it might get him in trouble with the INS." The producers tried to keep a lid on things because they wanted the appearance to be a total surprise, much like George Clooney's reappearance near the end of ER. A secret unknown to the internets? How quaint. The episode will air on January 27.